Rohingya Muslims in Jammu – have we learnt nothing? Right from the time BJP has come to shared power with PDP in Jammu & Kashmir, which some call an unmatched wedlock, tensions have been rising in the state. Amid continual arson and stone pelting in the valley, the latest addition to the list of dissonant issues is the matter of the settlement of Rohingya Muslims (refugees from Myanmar) in the state. Rohingyas are a roughly 1-million strong ethnic Muslim community in Myanmar, most of whom are denied citizenship rights as the Myanmar government considers them to be illegal immigrants from Bangladesh. A sizeable number have fled to Bharat, Bangladesh, Indonesia and Thailand to escape persecution and violence. Some 40,000-50,000 Rohingyas are believed to be living in Bharat, including nearly 7,000-8,000 in the Jammu region, which includes Jammu city and its outskirts. Many of them carry certificates issued by the United Nations High Commissioner for Refugees (UNHCR) in Delhi. Natives in Jammu believe the Rohingya population is actually larger. The grim memories of the Kashmiri Pandit genocide in 1989/90 and fact that Kashmir valley is already pulling a disproportionate chunk of the the state’s resources, leads many in predominantly Hindu Jammu to look at the settlement of new Muslim families in Jammu with resentment and suspicion. Settlements of Rohingya Muslims coming up at various places in Jammu city — and the fact that some are now marrying locally — appear to many Hindus as an attempt to change the demography of the region. There are no two ways that the state government of Jammu & Kashmir has not been successful in dealing with the matter soundly by ousting the Rohingyas from the state. Regarding the same, a strong contingent of Panthers Party activists led by Harsh Dev Singh, Yash Paul Kundal and other leaders recently staged a vigorous protest demonstration at Exhibition Ground, Jammu. The enraged protestors raised slogans of ‘Rohingyas Quit Jammu’ and ‘Bangladeshis Go Back’ besides anti-government slogans. Harsh Dev Singh said “In a recent development, a group of Rohingyas and Bangladeshi nationals have reportedly managed to buy land on the outskirts of Jammu city besides raising construction on lands of the Jammu Development Authority by procuring permanent resident certificates, Aadhaar cards and ration cards. This points to a larger conspiracy behind their settlement in the Dogra land,” he alleged. Addressing the media, Harsh said that Rohingyas and Bangladeshi immigrants have been involved in abductions and other crimes withstanding the confession of the State government that 17 FIRs had been registered against 38 Rohingyas for various offences including illegal border crossing. He said that there have been further reports of LeT operatives travelling from Pakistan to Bangladesh and Myanmar for recruiting Rohingya youth for terror, and the elimination of a Rohingya terrorist named ‘Chot Burmi’ (Abdur Rehman al Arkani) in Tral last year had established the alarming trend of Rohingyas getting involved in the Islamist jihad raging in Kashmir valley. Describing the soaring population of Rohingyas as a potential threat to the demography of Jammu Pradesh, Harsh said that the mass exodus of Kashmiri Pandits from the Valley followed by hegemony of separatists in Kashmir, glorification of militants, incentives and jobs to stone pelters amid the unlawful settlement of immigrants in the city of temples was undoubtedly manipulative and dangerous. He said that the criminal silence of the alliance and BJP in particular over the illegal settlement of foreign nationals vindicated the draconian motives of the dispensation to reduce Dogras to minority. Dubbing the constitution of GoM by the State Government to check the settlement of immigrants as mere bluff, he warned the saffron brigade to take serious cognizance of the security threat posed by Rohingyas in the wake of recent terror attacks in the state and urged the Union Home Ministry to facilitate their deportation to their native country without any further delay. 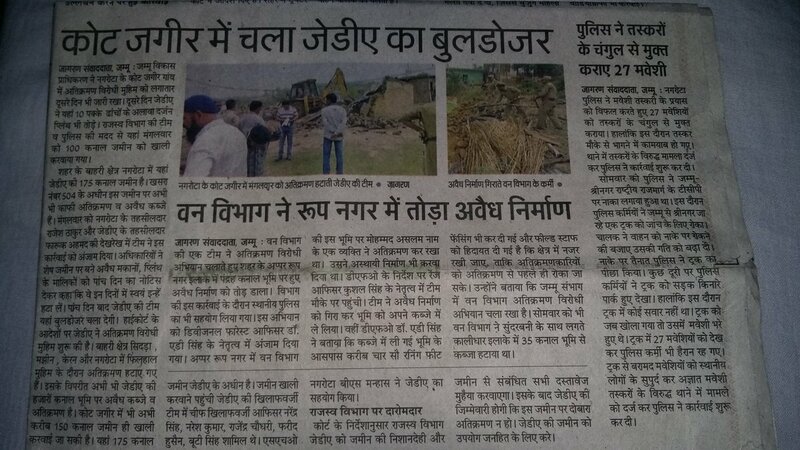 Authorities have recently demolished illegal constructions on encroached government land in strategic locations of Jammu’s Nagrota area according to a report published in Dainik Jagran. Two major militant attacks had rocked Jammu region on November 29 last year in which seven army personnel, including a Major, were killed and eight other security men, including a BSF DIG, were injured. One of those attacks occurred on an Army camp in the Nagrota cantonment. Late last year, following intensive operations of the Myanmar Army for removing Rohingya Muslim terrorists from its territory (after 9 Burmese policemen lost their lives in October in coordinated attacks by the Rohingyas), there has been a steep rise in the number of Rohingya refugees. The raided training camps were being allegedly run by the same rebel group that killed nine police personnel on different border checkposts last October. Myanmar’s security personnel recovered guns, ammunition and gunpowder from the training camps in Mayu Mountains, located in northwest border, home to the Rohingya minority, AFP reported. The government report also stated that the training camps run by the the rebels, now called Arakan Rohingya Salvation Army (ARSA), were being aided by foreign organisations. The recruits in the camp were being taught martial arts and given training in the use of light weapons. The government has accused ARSA of murdering and abducting villagers in recent months. In January this year, at least 65,000 Rohingyas fled to Bangladesh from Myanmar since the army launched a crackdown in the north of Rakhine state, according to the UN’s statement. The Rohingyas slipped into Bangladesh with lofty hope that a country such as Bangladesh with a Muslim majority will provide refuge, but it was not to be. Tough conditions in that country prompted them to cross over into Bharat. “I could not roam around outside the camp, they would put us in jail, the camp was overcrowded, so we came here,” said 27-year-old Jafar Alam. “I want to live in India”, he said. What happened to much touted Muslim brotherhood? Why are Muslim nations not able to take care of their ummah brothers? Countries like Malaysia (more than 60% Muslim population) who have substantial Muslim population are doing nothing but lip service by merely condemning the counter insurgency operations of the Burmese Army. If they are genuinely concerned, why don’t they open their doors for the Rohingya refugees? Saudi Arabia pumps billions of petro-dollars to spread radical Wahhabi Islamic doctrine (Rs. 1700 crore was spent on Bharat in 2011-13 alone), but the same Saudi Arabia can’t provide aid to the refugee camps in Bangladesh? When Saudi and the other rich Gulf nations have such an abysmal record in aiding the 9 million Syrian refugees, who belong to the same Arab racial stock, their apathy for non-Arab Rohingya Muslims comes as no surprise. Even when Rohingya refugees have managed to walk all the way from Myanmar to Saudi, they have received no legal documentation from the Saudi Government, even after decades of living in that ‘holy land’ for Muslims! Islamists living in Bharat will riot for the Rohingya Muslim ’cause’, as we saw in the notorious 2013 Azad Maidan riots conducted with connivance of ‘secular’ political parties, but none will question their Saudi masters over the blatant double standards. “Rohingyas are not only confined to Jammu but have gradually crept into the heartland as well. An estimated 5,000 Rohingya refugees live around Delhi, with a particularly large number living in slums along Sohna Road near Gurgaon. Officials also red flagged such clusters following evidence that a section of the Rohingya community has been radicalized by pan-Islamist groups. These groups have attracted a few Rohingyas by promising to help them carry out retribution against Myanmar, Bangladesh and Bharat. Rohingyas – Muslims of the northern part of Rakhine state – see themselves as an indigenous minority of Myanmar, but the Aung San Suu Kyi government considers them Bangladeshi migrants. During the Pakistan Movement in the 1940s, Rohingya Muslims in western Burma organized a separatist movement to merge the region into East Pakistan (today’s Bangladesh). Before the independence of Myanmar in January 1948, Muslim leaders from Arakan addressed themselves to Muhammad Ali Jinnah, the founder of Pakistan, and asked his assistance in incorporating the Mayu region to Pakistan considering their religious affinity and geographical proximity with East Pakistan. After Jinnah’s refusal, Rohingya elders founded the Mujahid party as a jihad movement in northern Arakan in 1947. The aim of the Mujahid party was to create an autonomous Muslim state in Arakan. By the 1950s, they began to use the term “Rohingya” which may be a continuation of the term Rooinga to establish a distinct identity and identify themselves as indigenous. They were much more active before the 1962 Burmese coup d’état by General Ne Win. Ne Win carried out military operations against them over a period of two decades. The prominent one was Operation King Dragon, which took place in 1978; as a result, many Muslims in the region fled to neighboring Bangladesh as refugees. In addition to Bangladesh, a large number of Rohingyas also migrated to Karachi, Pakistan. Rohingya mujahideen are still active within the remote areas of Arakan. In light of the above, letting Rohingyas settle in Bharat, that too in a sensitive state like Jammu & Kashmir, can only prove detrimental to internal security. “If West Pakistan Refugees (WPRs) can’t be given citizenship after three generations, how can these people (Rohingyas) be allowed to stay in the state. Their settlement in a sensitive border state is a great threat to national security,” BJP MLA from Nowshera, Ravinder Raina, said recently in the Jammu and Kashmir Assembly, before demanding the headcount of these displaced people. WPRs are Hindu refugees who migrated from West Pakistan after partition to settle in Kathua, Samba and Jammu districts of the state. They have been demanding citizenship rights, a right to vote, contest state assembly polls and a rehabilitation package in vain for the past 70 years. At present, WPRs comprise 19,960 families with a population of around 80,000 to 85,000. They are not considered naturalised citizens of the state even though many of them have been living in the state from three generations. They are only entitled to vote in parliament elections, but can’t exercise their franchise in state assembly polls. The J&K Constitution provides voting rights in assembly and local body polls only to naturalised residents. Recently, the J&K government’s decision to grant ‘identity certificates‘ to WPRs was widely criticized by Congress, NC and separatist leaders as an ‘Israel-like attempt’ to dilute the Muslim majority nature of J&K. Government’s clarification that WPRs would continue to be “non-state subjects” fell on deaf ears. In fact, ‘mainstream’ politicians like Mustafa Kemal (Farooq Abdullah’s brother) are spinning outlandish conspiracy theories that Rohingyas were being deliberately settled in Jammu to “dilute the criticism that was being justifiably raised against the PDP-BJP move to absorb West Pakistan refugees in the state”. Labha Ram Gandhi, chairman of the West Pakistan Refugees Action Committee 1947, said that a false impression is being created that our status has been changed. He accused all the successive central governments for their plight. “The settlement of WPRs is a humanitarian issue and not a political issue or a communal issue. Despite living here for 70 years, nobody owns us. In the past seven decades from various governments, we have received mere assurances of giving us basic fundamental rights. Many committees, groups, were formed to look into our demands, but till date they remain only on papers”, lamented Gandhi. “In the grab of an identification certificate, there is a sinister design to convert the entire J&K into a Muslim state or get it integrated with Pakistan. The saddest part is weak and appeasement policies are being pursued by the successive Central governments, which led to the present situation,” he added. In a recent report, the well regarded International Crisis Group, based on primary research, flagged the emergence of a new insurgent group – Haraqah Al-Yaqin – led by Rohingya emigres in Saudi Arabia, commanded by Rohingyas on the ground with international training and abreast with modern guerrilla tactics. “A new Muslim militant minority across Bharat’s eastern border poses a severe security threat to the stability in Bangladesh and, in turn, across Assam and northeast Bharat. Several thousands of Rohingya refugees already reside in Bharat,” as per a security analyst. Incidentally, the terror attack in and around Mahabodhi Temple in Bodh Gaya on July 7, 2013, was targeted at international Buddhist tourists to avenge the killings of Rohingya Muslims in Myanmar, according to arrested SIMI and Indian Mujahideen suspect Mohammed Umair Siddiqui. “Since then it is believed that around 40,000 Rohingya Muslims have entered into our country illegally through Bangladesh, through Bay of Bengal and through Myanmar border,” he said. The alarming thing is that many of the Rohingya muslims who are now in Jammu have already got the Aadhaar card, Mahtab said, adding that the government should act immediately. “Let us not wait for cloudburst; already dark clouds have appeared. There is a very serious incident that has happened in Bodhgaya and it is now linked to Indian Mujahideen which has connection with IS and now Rohingyas are being targetted to be trained as terrorists in this country,” Mahtab said. When West Pakistan Hindu refugees are languishing as non-state subjects and no other citizen of the country has the right to settle in J&K due to the obscene Article 370 drafted by Nehru-Abdullah duo, how can the state and central government even tolerate presence of Rohingya Muslim refugees in J&K state? BJP has the most to answer on this. Even if Rohingyas must settle in J&K, why are they settling in Hindu-majority Jammu and not the Muslim-dominated Kashmir valley? How long will we pretend to be blind to the fact that settlement of Rohingyas in Jammu is part of the process to cleanse Hindus, similar to how Hindus were cleansed from Kashmir in 1989/90. Muslim share of population has been rising in the Jammu region since 1981 – it has risen sharply from 30.7% in 2001 to 33.5% in 2011. Rohingya Muslims are locked in an old jihadi struggle with state of Myanmar. We in Bharat have first-hand experience of how deadly an Islamist separatist struggle is, and how the Islamist propaganda machinery creates victimhood complex among ordinary Muslims. We must support Myanmar in its fight against Islamic terror, while engaging with it to minimize harm to civilians. Muslim nations like Bangladesh, Saudi, Malaysia, Indonesia, Pakistan have a moral obligation to help those Rohingyas who are victims of the conflict. Bharat has is its hands full to rehabilitate the Hindus refugees fleeing from terrible persecution in Bangladesh and Pakistan. We cannot provide refuge to Rohingya Muslims under any condition. We must deport the Rohingyas at once – and till the time that is done, they must be kept in well-defined, secure camps.